Are you a single mom who likes to write? Here’s why you should start making it a steady, daily habit. Long before I knew I was an introvert, I knew that writing was a natural outlet for me. For as long as I can remember, I’ve had words in my head desperate to be let out onto the page. In elementary school, I often chose to stay inside during recess, preferring the relationship with a pencil and a blank page to the chaos of the playground. I continued to write all throughout school—junior high, high school, college. I filled dozens of black hardback books with stories, thoughts, and doodles. I was always lugging one around in my bag. The journals were safe places to store my dreams and fantasies and fears, to express myself in a world that often seemed too loud to hear me. During my marriage, there was a time when I stopped writing consistently. When I did write, it wasn’t really for me anymore—I wrote content for our business website, to-do lists, meeting minutes, thank-you notes for baby clothes and wedding gifts. But after I left my ex-husband and filed for divorce, I found a sudden swell of words again. In the chaos of my divorce, I found my way back to writing, as I had when I was very young. The words came like a storm—urgent, ungraceful, messy. Angry. Grateful. Healing. Centering. Whether you’re going through a divorce or simply in the throes of single motherhood, writing can have profound psychological and health benefits. It turns out that setting a regular writing practice can help to clear your mind, express your priorities and dreams, rebuild your confidence, and ultimately manifest change in your life. Science shows a clear correlation between maintaining a writing practice and boosting self-confidence, especially when writing about good memories or positive feelings. We receive this psychological “boost” when we revisit good thoughts and feelings through the writing process. If there was one thing that suffered most over the course of my marriage, it was my confidence—to the point where I was not sure I was good at anything anymore. When I began my writing practice again, it felt rusty and awkward. It was like jump-starting an old car and crossing my fingers that it would catch. But as I spent more time sitting with the page and combing through memories, it became easier. My confidence began to improve—and not because I suddenly felt blown away by new writing skills. My confidence improved simply because I was turning my attention onto myself. I was giving myself time and attention, something I had not thought to do in the midst of an abusive marriage, a chaotic divorce, and the intensity of early parenthood. It was through my writing practice that I began declaring “I am valuable; I am valuable,” over and over again, day after day. 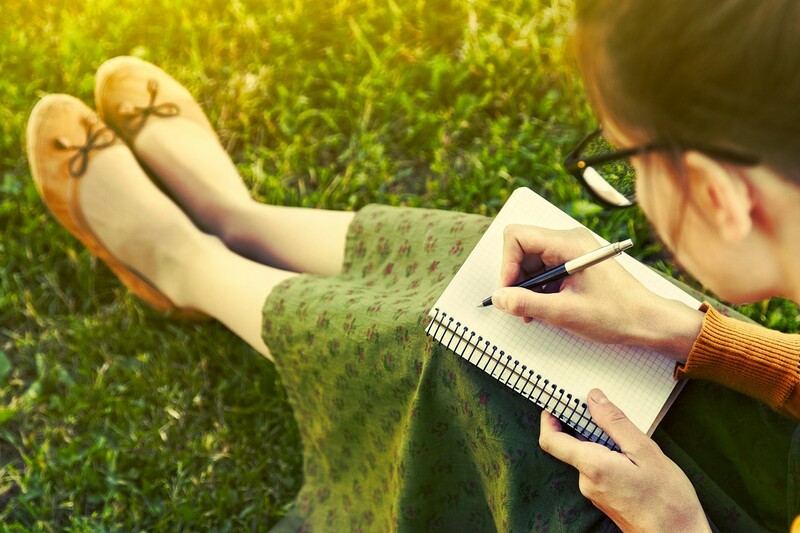 While studies show that people who integrate a regular writing practice, especially when writing about traumatic memories, may initially feel more stressed, over time the benefits of writing create improved long-term health. People with a regular writing practice are less stressed, have stronger immune cells (called T lymphocytes), lower blood pressure, better organ function, and fewer depressive symptoms. Additionally, they experience fewer trigger symptoms related to post-traumatic stress disorder. A regular writing practice is also linked to a decrease in asthma and rheumatoid arthritis symptoms. And when our physical health is improved, our stress goes down, and our minds become healthier. I made some important personal and emotional discoveries through writing in the aftermath of my divorce. For example, I discovered that I blamed myself for choosing the wrong husband, for ignoring the red flags, for not leaving him earlier. And although expressing those thoughts was painful, it also provided a way through the pain. Writing gave me an outlet to forgive myself for the things I did not know, decisions I made, roads that I chose without fully thinking about them. I often wrote in big arching circles—following my feelings, letting them lead me where I needed to go. And the result was that I repaired my relationship with myself. It was as though I were processing my feelings with a friend or a significant other, expressing disappointment and hurt, anger and frustration. And eventually, I cracked through that wall of self-forgiveness. I am a terrible meditator. I find my mind wandering, picking through all the pieces of my day, my to-do list, frustrations with my ex, struggles with Solo Mom life. Writing is my meditation. It is my quiet center. And I have found it 100% necessary in my Solo Mom journey to lean into this quiet center. It is a place I can go that is just for me—where yogurt isn’t being smeared on the walls, where my children are not screaming, where bills and jobs and court documents are irrelevant. When I make space for writing, I make space for me. I make space for the quiet that I do not get in the rest of my busy life. And I will always be grateful for that. It has been essential for me to be able to find language that expresses who I truly am and what I want from my life. It has been essential for me to write my story. I wrestle with that language on the page—late at night while the kids are asleep, in stolen moments during the day. This language has given me a map to follow. This map has led to the rediscovering of my authentic voice. When I journal or freewrite, I release all expectations of myself. I simply allow myself to tap into the conversations in my head. There is no right or wrong. While journaling, I refuse to allow any sort of unkind thoughts about my capabilities or my writing to filter in. I just write. And if I don’t know what to write, I write “I don’t know what to write, I don’t know what to write . . . ” over and over again until something becomes unlocked. And in the unlocking, I find my authentic voice. It has lived there all along.